To be honest the Grand doesn't feel like the kind've pub that would even have a parma. The dining room is a fine dining gastropub affair, with menu items such as Tortelli di patate con funghi, burro e salvia and Bollito misto con lenticchie, salsa verde e finocchio brasato. The Public Bar however, is a bit of a more laid back affair. 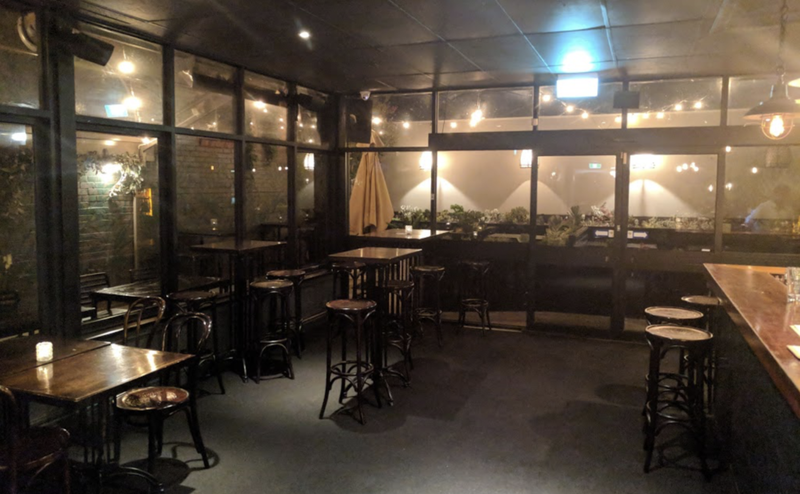 The cosy lounge area in front opens up to bright glass room and spacious beer garden. Well, menu, you've got one thing right - I do want a parma. This is a menu that screams confidence in their product, fingers crossed they've got the ability to back it up. As for beers on tap it was a small but robust selection. Stone & Wood, Mountain Goat were there kicking things off strongly, backed up with a few more adventurous selections, including a stout and saison. If nothing on tap tickled your fancy the fridge behind the bar housed a few more boutique options - Definitely something for everyone to wet their whistle's at the Grand. We ordered our meals and about 15-20 minutes later the parmas hit the table. Schnitzel thickness varied around the table but overall it was pretty good. decently sized and real, unprocessed chicken breast (mine seemed to be two smaller schnitzels fuzed together as opposed to one big one). I wasn't a huge fan of the crumbs, they had a strong store-bought vibe and were a little bit soggy, in contrast to the chicken itself which seemed a little dry. Not an offensive schnitzel, yet nothing too exciting either. The toppings were overall quite tasty. Cheese blend was on point and the napoli was fresh and plentiful without tasting canned. The toppings definitely helped elevate a so/so schnitzel. The one omission? No ham. I stand by the claim that a good parma doesn't need ham if the rest of the elements are perfect (the parma that started it all was ham free and it was perfection on a plate). 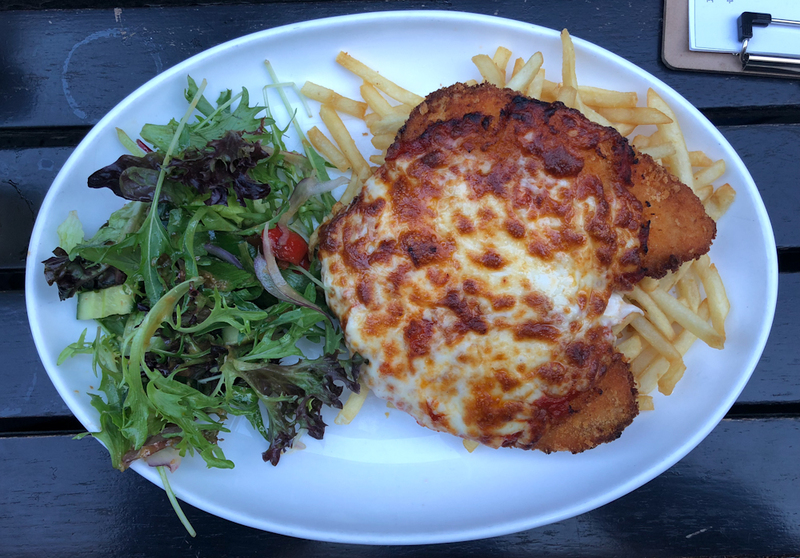 The toppings on the Grand Parma were great, they raised what would have been a pretty bland schnitzel to new heights - But it would have been even better had they thrown a slice of ham/prosciutto/bacon/something into the mix. I’m a sucker for shoestring fries. They don’t belong on a plate with a parma, but they were at the appropriate crispy/soggy boundary that satisfies me. For the parma itself, the sauce and cheese were all that saved it for me. The schnitzel left a little to be desired. Not cold, not overcooked, not burnt... not much of anything notable. Parma was simultaneously dry yet soggy enough for the crumbs to fall off. Massive omission not having ham featured. The Napoli was tasty but there wasn’t a lot of it. Cheese coverage left a bit to be desired but was melted enough to be stretched to cover bare patches. Decent size though. The shoestring fries were perfectly cooked, which is a rare feat for shoestrings. The salad was actually great; substituting huge wedges of tomato for roasted capsicum was a great idea and the dressing was tasty. As far as value goes I think Reviewer Emi hit the nail on the head - Not quite worth the full $24. If it had ham I'd say it'd be worth the price, but as it is I'd say this is a $20 parma ... maybe as high as $22. As far as I can see the Grand doesn't offer any sort of parma night (although Wednesday Duck Night does look delightful). Overall the Grand is a super cosy pub with friendly staff and a fantastic beer garden and I have no doubt that the food coming out of the dining room is phenomenal. The parma was good, but it missed the mark in a few areas and just fell short of greatness. I'd say it's worth a visit if you're in the area, fingers crossed they add a slice or two of ham in the future. Lets face it... You know we WANT it!